All forms of gambling are regulated and legal in France. Brick-and-mortar operations may host card games, casino games, sportsbooks, and racing betting while online operations may offer all the same except casino games. All-in-all, France is a gambling-friendly nation. It's not all smooth sailing in France though. High taxes and excessive regulation make it difficult for licensed gaming sites to stay in business. Nearly half of the gaming sites that acquired licenses in 2010 have since left the market. The high taxes on poker pots and sports bets also affect players, which has resulted in large numbers of players choosing to do business with unlicensed foreign sites. The good news is gamblers have options. Since there are no laws that criminalize playing at unlicensed sites, players can choose from the whole assortment of licensed and unlicensed sites. If you like what you see at a French-legal gaming site, you're good to go. If you'd rather gamble somewhere else, you can choose from a wide range of other options. The biggest change in gaming law in recent history happened in 2010. After pressure from the EU to end its restrictive gaming laws, the French government passed the Gambling Act (Law number 2010-476). 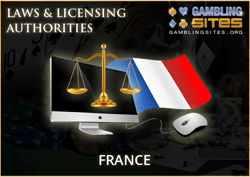 The act created the Regulatory Authority for Online Games (ARJEL) whose responsibility it became to license and regulate online gambling in France. The Gambling Act was important for players, because it disbanded the government monopoly that existed previous to the passage of the law. Now, the French market was open to competition from other EU gaming sites. 35 companies applied for licenses and became the first non-government entities to offer online poker, sports betting, and horse racing betting. French politicians chose not to include traditional casino games such as roulette, slot machines, and table games because they felt those games would be too addictive. To this day, traditional casino games aren't offered by French-licensed gaming sites. Some of the bigger names to get licenses included PokerStars, Party Poker, and Everest Poker. About a dozen sports betting organizations also received licenses. The introduction of competition to the market was a good thing for players, but there was one problem: taxes. The Gambling Act called for excessive taxes on both poker and sports betting. All poker pots are taxed 2% in addition to the rake poker sites normally take out of pots. To this day, players pay upwards of 7.5% in total rake (compared to an industry average of 4-5%) on every pot. Sports betting was hit with an 8.5% tax on all bets placed. Both sports betting and poker suffer from these taxes. Players complain that the higher tax rates result in a higher-than-normal rake in poker and less likelihood of making money with sports betting. Several poker sites have even left the market due to the onerous tax laws. To top it all off, the Gambling Act doesn't allow player pools to be shared across national borders. This means French players are cut off from the international poker scene. When you play on a licensed French poker site, you only play with people who are located in France. This has caused liquidity problems for licensed sites as they find it difficult to keep the games running with a limited player pool. The high taxes and restricted player pool have led to many players choosing to play at unlicensed sites headquartered out of other countries. The French gambling market has great potential, but it's stifled by the burdensome regulations and taxes.